Anna Burns has been named the winner of this year’s Man Booker Prize – becoming the first author from Northern Ireland to triumph. Milkman, set in an unnamed city in Northern Ireland during the Troubles, is a coming-of-age story about a young girl’s affair with a married man. Burns, who told the BBC she was “stunned” to win, will receive £50,000 in prize money. The judges said Milkman was “simply marvellous”. They highlighted the “distinctive and consistently realised voice of the funny, resilient, astute, plain-spoken, first-person protagonist”. Milkman beat competition from Everything Under by Daisy Johnson – who, at 27, was the youngest nominee in Man Booker history. The other nominees were The Long Take by Robin Robertson, Washington Black by Esi Edugyan, The Mars Room by Rachel Kushner, and The Overstory by Richard Powers. Milkman is the fourth novel to be written by Burns, who was born in Belfast in 1962. Her debut, No Bones, was published in 2001, and followed by Little Constructions six years later. Her most recent work prior to Milkman was Mostly Hero – a novella published in 2014. 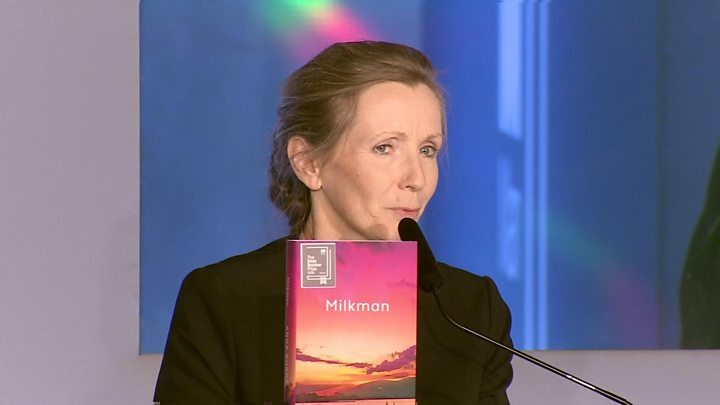 Speaking to BBC News, Kwame Anthony Appiah, the chairman of the judges, said: “One of the wonderful things about [Milkman] is the texture of the language. “It’s written in this amazing voice of this woman who is living in a divided society. Burns opted not to give names to her characters in the novel – even her narrator refers to herself as “Middle Sister”. Speaking after her win, Burns told BBC News: “The book just didn’t work with names. How did the critics rate the book? Writing in the Guardian, Claire Kilroy said: “The narrator of Milkman disrupts the status quo not through being political, heroic or violently opposed, but because she is original, funny, disarmingly oblique and unique: different. In his five-star review in the Daily Telegraph, Cal Revely-Calder described the novel as “viciously funny”. “The pace of Milkman is leisurely at best, because its narrator experiences the plot as an entirely unwelcome event,” he added. The New Statesman’s Catherine Taylor said every character in the novel “crackles with intellectual verve and droll verbosity”. “The novel is an unusual and beguiling piece of prose,” wrote Alison Garden in The Irish Times. Kwame Anthony Appiah added that Milkman’s lead character was “an extremely interesting voice”. Asked whether he accepts Milkman is a challenging read, Appiah replied it was “enormously rewarding” provided readers persist with it. “It is true that because of the flow of the language and the length of the sentences and the fact that some of the language is unfamiliar, that it is not a light read. “It’s challenging in the way a walk up Snowdon is challenging – it’s definitely worth it because the view is terrific when you get to the top.